The copper box hosting the CCD in the DAMIC set-up at SNOLAB. The DAMIC (Dark Matter in CCDs) experiment is an extremely low threshold direct dark matter detection experiment aimed at detecting, or convincingly ruling out the existence of, extremely low mass WIMPs. DAMIC began as a KICP New Initiative and is rapidly approaching completion. 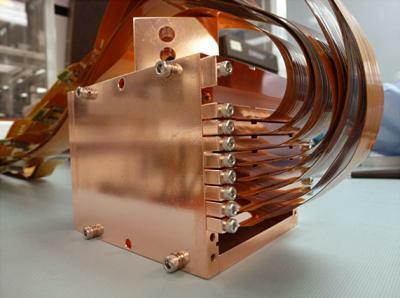 The final configuration of the experiment will consist of eighteen, 650 μm-thick, 16 Megapixel CCDs with a total mass of 100 g in a vacuum vessel which is surrounded by extremely-low-background shielding. The experiment is housed deep underground in SNOLAB. These CCDs have a very low noise level of 6.5 eV; allowing for a very low energy threshold for the detection of WIMP scattering. This will lead to world-leading sensitivity to very light WIMPs. Results from DAMIC should convincingly cover the low mass WIMP region of parameter space and directly probe the potential signal from the CDMS-II experiment.